The Transpac Yacht Race first kicked off in 1906. As one of the longest ocean races, it is now considered one of the oldest distance races in the sailing world. 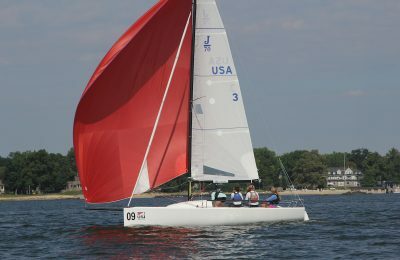 North Sails is proud to support clients throughout the fleet in their pursuit of unique performance goals, ranging from the Hobie 33 to the MOD 70! Competitors began their journey from Los Angeles, CA to Honolulu, HI beating against rough conditions as they worked offshore. In true Transpac fashion, the fleet found sweet relief by reaching the Eastern trade winds, sending them on an easier heading to Diamond Head, Oahu. “Even the most hard-core offshore sailors will experience seasickness in that first offshore stretch,” explained Steve Calder, North designer and main trimmer on H.L. Enloe’s Mighty Merloe, which broke the multihull course record this year. The Transpac can be a trying race for sailors of all ranks and ages, with wind reports often ranging from 15-50 knots. A diverse fleet of yachts reflects the depth of offshore racing in Southern California, with each owner, charterer, and navigator completing a minimum of 150 nm offshore before entering, as well as a list of safety checks for the boat and crew. In its 49th edition, we have witnessed three elapsed time records set and a strong performance by North Sails clients throughout the Transpac fleet, which was split into four starts. The record-setting Maxis, MOD 70s and ORMA 60s of the 3rd and 4th start were sipping Mai-Tai’s onshore after a five-day sprint. This year the faster-rated boats managed to fare well on corrected time by staying ahead of a high. Some of the sailors are still working their way toward Hawaii, with a large crowd of fellow sailors there to greet them. Setting a new time-to-beat for multihulls, ORMA 60 Mighty Merloe won 1st in Line Honors and 1st in Multihull Division 0. 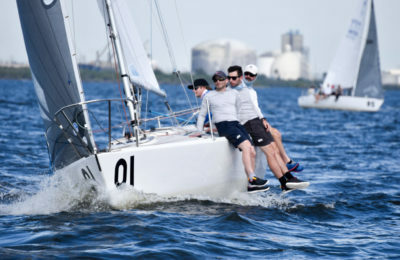 Second place in Division 0 was Lloyd Thornburg’s MOD 70 Phaedo3, followed by Gunboat 62 Chim Chim, MOD 70 Maserati, and LoeReal, a Jeanneau Trimaran. North Sails is proud to power all multihulls in the fleet this year with a mix of 3Di upwind and downwind sails. Super-maxi Comanche was another North-powered boat making waves this year, setting the monohull course record and covering 484.1 nm in 24 hours on the way, thereby setting a new 24hr Transpac speed record. Comanche, finishing in 5 days 1 hour 55 minutes 26 seconds, also secured the race’s Merlin Trophy: the fastest elapsed time by a power-assisted yacht. Manouch Moshayedi’s Rio 100, secured the Barn Door Trophy for the second time in a row for the fastest elapsed time by an unassisted monohull, racing this year with an A3 from North Sails. The Pac 50’s in Division 1 had great speed in the conditions. North-powered Invisible Hand placed 1st in Division 1 followed by Bad Pak in 2nd. Invisible Hand also took First Place Overall in ORR. Congrats to Roy Disney’s Pyewacket, Transpac winner in 1997 and 1999, who won Division 2 this year. Followed by fellow North client’s Catapult and Merlin, finishing 2nd and 3rd in Division 2.